This collectible 2014 David Beckham calendar is now available to buy and enjoy throughout the whole of the year. Keep it for yourself or add it to your gift list for a fan. At 38, David Beckham is not only one of the most famous footballers in the world, but is also now considered a much recognised fashion guru and magnet for lucrative product endorsements. Married to ex-Spice girl, Victoria Beckham, much of his recent activity appears to have been outside of the football world, although he had been playing for Los Angeles Galaxy and latterly Paris Saint-Germain. However, he has now made the decision to retire from the world of soccer. 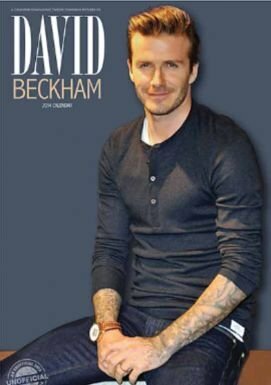 David Beckham's accomplishments on the football pitch are well known to those who follow the sport, but it seems that his personal life is the stuff of legend and a subject that captures the headlines on a regular basis. Apart from his marriage, Beckham's biggest talking point is the number of tattoos he has applied to his body. At last count, there were over twenty, including the names of his children and wife, while the latest one is a monochrome picture of Christ based on a painting named The Man of Sorrows. The David Beckham 2014 wall calendar is full of superb photos of this football star. Any fan of Beckham will love this calendar, whether as someone to aspire to be or simply just to gaze at! Throughout his footballing career, Beckham has often been assigned the label of both hero and villain. His sometime angry temperament has caused him to be red-carded on several occasions, most notably during the 1998 World Cup. However, because of his skill to place the ball exactly where he wants it and to create scoring chances through his undeniable ability from free kicks, he has since re-established an ongoing devotion from football fans in the UK and elsewhere. His career highlights have certainly outshone any lowpoints. He has not only captained his international side, but also helped Manchester United win several league titles and a couple of FA Cups during the 1990s. He then moved to Spain winning a league title with Real Madrid, before moving to the States and securing a successful career with LA Galaxy. There, Beckham was a part of the team's second successive Western Conference title and first MLS Supporters' Shield. Although his future club career was in question, in the end he decided to move to the French club Paris Saint-Germain. At the end of the 2013 season, fans learned that he had made the decision to retire from competitive play, so one thing is for sure, the football world will miss his unenviable skill at set pieces, particularly the free kick. Choose a calendar featuring your favourite celebrity. Are you a David Beckham fan? Very nice calendar, I still use calendars to write all my vital dates on, I find the visual serves as a helpful reminder for me as I take my smart phone as too much an intrusion at times. I love the David Beckham Calendar all the more reason paper calendars are very useful indeed.